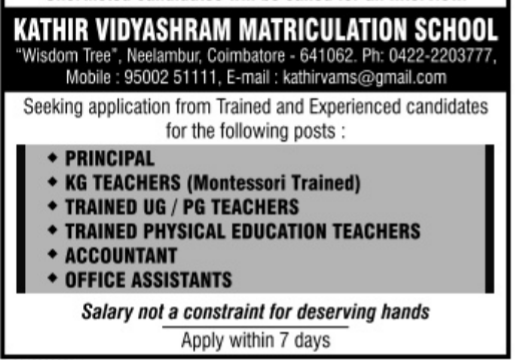 Kathir Vidyashram Matriculation School, Coimbatore has advertised in DINAMALAR newspaper for recruitment of Principal PGT / TGT ,Non Teaching Staff jobs vacancies. Interested and eligible job aspirants are requested to apply with in 7 day s from 15th April 2018. Check out further more details below. 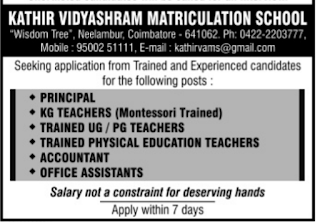 Name of the School: Kathir Vidyashram Matriculation School, Coimbatore. About School: Kathir Vidyaa Mandhir was established with a global vision to prepare the children to be effective critical thinkers, communicators, collaborators and creators who value education as a lifelong process. Kathir Vidyaa Mandhir employs a holistic approach to education, empowering children to become caring, competent and responsible citizens. We endeavor to nurture the child’s intellectual, physical, moral and social needs and in the process also prepare his/her to meet the needs of the global economy. Salary not a constraint for deserving hands. How to Apply: Apply with in 7 days. Last Date: with in 7 days from 15th April 2018.